Has Vatican called for creation of a "World Authority" on global finance? If accurate, this is OMINOUS! As my readers know, I despise Catholic bashing, just as I do Jew bashing, indiscriminate Moslem bashing, and fundamentalist Protestant bashing. However, equally true is that there has definitely been proven infiltration just about everywhere in all of the above circles. I took a peek at Farmer's website this morning. As my readers know, Bjorn Freiberg and I have had our serious differences. However, he has definitely performed valuable research over the years and I'm not going to ignore a call of "fire" just because I don't like the particular fireman. Today, he posts alarming information that I'm going to check out and suggest you do so also: that at least one Vatican spokesman, Cardinal Peter Turkson, has issued a call for a "supranational authority" to deal with global financial issues. Cardinal Turkson is a new name to me, so I'm asking our Catholic regulars for more information here. Lee Penn, himself a Catholic, has expressed many concerns to me about the Vatican's current direction. I would appreciate feedback on this and trust we can share relevant information about it here. Farmer's blogspot today re Vatican and global authority on economy. It seems as though it is one of the BIG news stories of the day. Here's a picture of the Catholic News Service report. You can read the whole thing and follow their links by clicking here. Yes, the author is right for the wrong reasons. This is clearly "the spirit of revolution." The indignados of Spain show further that it is clearly an anti-clerical, anti-God movement. This is what happened in Mexico from 1926 to 1935 (longer in some provinces). Interestingly, it was Javier Solana's grandfather/uncle/cousin/whatever, Salvador de Madariaga who made the impassioned defense of Mexico before the League of Nations that resulted in Mexico's admission to the League at the height of their anti-God carnage! Anticlericalism which has always been a precursor to terror to religionists is on the rise again. Today, it is reported that an anti-clerical party came to ascendancy in the Polish government, normally a heavily Catholic country. It was anti-clericalism that saw thousands of heads guillotined during the French revolution. It was anti-clericalism that saw hundreds of thousands of Christians killed in Mexico from 1926-to 1935. It was anti-clericalism that saw Catholic churches sacked and priests and nuns burned alive in Spain from 1936 to 1939. For those who think maybe it is the Roman Catholic Church "getting her comeuppance", please note that the targets of the occult/New Age forces are Jews, Christians, and Moslems. 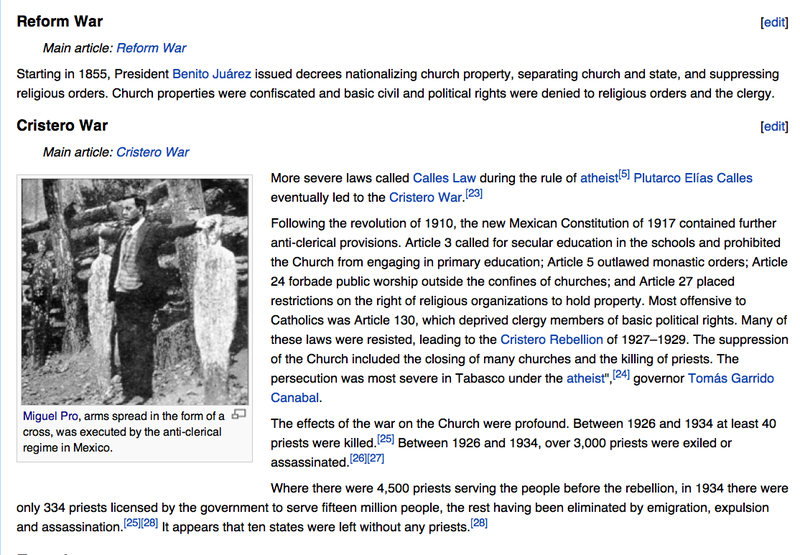 Mexican persecution started with Catholics from 1926 to 1935 and many Protestant denominations initially cooperated with the government thinking they were not affected, but surprise, surprise, they were. It looks like dangerous days may well be here and as Russian Orthodox priest Brother Seraphim Rose wrote in his book, RELIGION AND THE ORTHODOXY OF THE FUTURE, these days will be very terrible indeed. Remember the Book of Revelation promise: "they overcame the beast by the blood of the Lamb and the word of their testimony and they loved not their lives unto the death." May the Lord strengthen and protect us all. P.S. The language in this release is a cross between the Communist Manifesto and PLANETARY INITIATIVE FOR THE WORLD WE CHOOSE of 1981-1982!!! A cross between "the Conmunist Manifesto" and "Planetary Initiative for the World We Choose" of 1981-1982! This is a propaganda video for the "United for Global Change." It carries the very "WE ARE ALL ONE" message the Alice Bailey books said the world would have to believe to accept the "Masters of Wisdom ['externalized hierarchy' and "The Reappearance of the Christ" ['Maitreya/Betraya, that is, definitely NOT JESUS]. 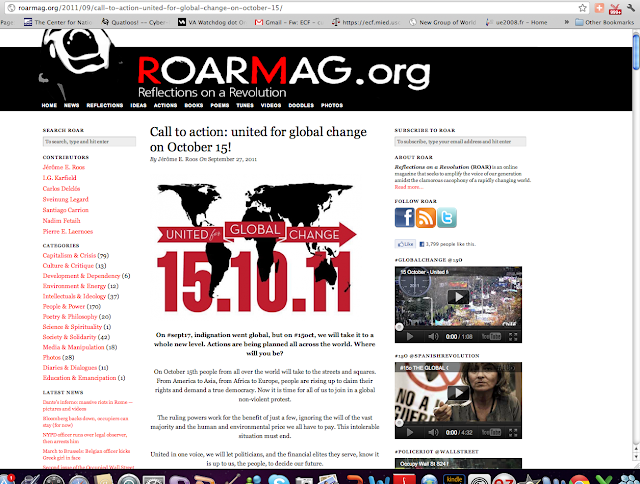 The Occupy Wall Street was a component of "United for Global Change." Note carefully the "spiritual" components of this "leaderless movement." NOETIC CORPORATION? TRANSITIONAL INTERNATIONAL LAW ENFORCEMENT? CHECK THIS OUT!!!! IS THIS OMINOUS OR WHAT? 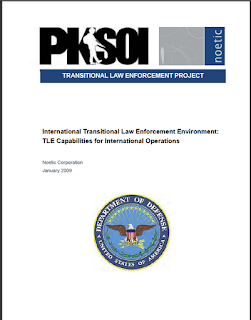 This is the "Transitional Law Enforcement Project" contracted with the NOETIC CORPORATION by the United States Department of Defense. QUERY: IF THIS IS WHAT THEY ARE SHOWING PUBLICLY, WHAT DOES THE 'CLASSIFIED' MATERIAL LOOK LIKE? I shudder to think! 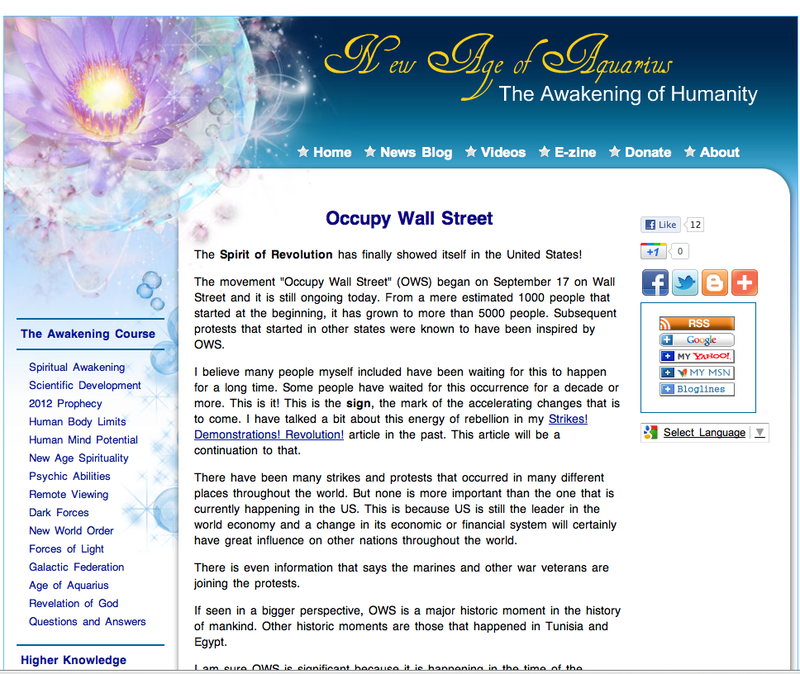 Appreciate your inputs and your own research on this one, especially as the obvious world wide New Age Revolution advances via events such as "Arab Spring," "OccupyWallStreet" and the like. As regards the "Noetic Corporation," fascinating occult choice of names! An accident? I doubt it! By the way, make sure your archive the material. The New Agers have a way of using "disappearing ink." Michael Dowd's website page - complete with Matthew Fox endorsement! He is also active with Barbara Marx Hubbard and the rest of the New Age "conscious evolution" crowd. 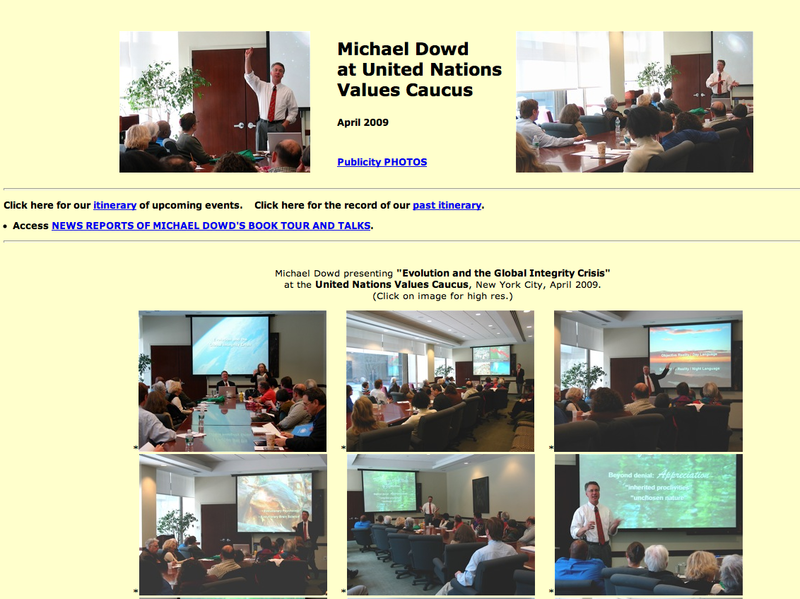 Michael Dowd preaching his perspective to the United Nations "Values Caucus"
Michael Dowd is a minister. He used to believe he was a Christian one. He is still given Christian pulpits, wears pastoral robes and claims to preach "the good news." That is the not the Christian gospel. He thinks he's way too "advanced" for that. It is the "good news of 'evolution'" rejecting God's word, and rejecting the necessity for Jesus Christ and his atonement. Once upon a time he was an evangelical Christian, per his book, THANK GOD FOR EVOLUTION. As you can see from the picture above of his website, he proudly bears Matthew Fox's endorsement. Matthew Fox was excommunicated from the Roman Catholic Church in 1993 for, inter alia, his rejection of the doctrine of Original Sin. Fox says we have instead "original blessing," and as such, we don't need Jesus Christ and his atonement. Matthew Fox and his Bear & Company are one of the most prolific of New Age publishers. One of Matthew Fox's "original blessers" is Lucis Trust, the successor to Lucifer Publishing Company formed by Alice and Foster Bailey in 1922. How and when Michael Dowd became a convert to evolution started at a Christian college, Evangel University. Located in Springfield, Missouri, it is the higher educational arm of the Assemblies of God denomination. He says there was a circle of professors who confided their belief in evolution and rejection of Creation. It was there that his intellectual belief in evolution began. His "heart-felt" conversion came from hearing a Catholic speaker. VCReporter: For much of mankind, religion and science have gone together like oil and water, and it seems, as a reverend, you’re sort of in the middle of it trying to link the two. Michael Dowd: What I’m trying to do is show how scientific, historic and cross-cultural evidence reveals divine guidance, or divine communication, or whatever you want to call it. When I speak to religious people, I call it God’s word or scripture. The idea that old books are a better guide or a better map of what’s real and what’s important than current guidance has led to collective insanity. Scientific, historic and cross-cultural evidence are our best and most important map of what’s real and what’s important. So I’m trying to show religious people how it is that science reveals divine guidance better than the Bible, better than the Quran, better than any ancient text. And I’m trying to show nonreligious people how our best scientific understanding of reality, which is called “big history,” shows how deeply inspiring and empowering an evidential science-based world view is, and that evolution isn’t just about Darwin, DNA and dinosaurs. Evolution is about how we understand ourselves and the quality of our lives, and whether we’re going to struggle with our lives or have fruitful, amazing joyous lives because how we think about our human nature profoundly impacts the quality of our lives. If I believe the reason I have a difficult time living in integrity, and why I shoot myself in the foot and why I have negative thoughts and patterns, if I think all of that is because my great-great-great great-grandmother ate an apple, I am going to be clueless about how to live in integrity. This is a sad fruit of Christian educators ignoring the New Age Movement and its now very obvious dangers. Michael Dowd would do well to dust off his old Bible and carefully read Thessalonians, chapter 2 (giving a profile of those who accept the anti-Christ ) and Revelation Chapter 14 (giving warnings about the "everlasting gospel" and the fate of those who depart from it, combined with warnings to worship God who created the heavens, the earth, the sea, and the fountains of waters. If Michael Dowd believes those passages are not being literally fulfilled, he might want to take a cold, sober look in the mirror. His very soul is at stake. Those Christian educators who sold him out have their souls at stake, even more so! He went from being an ardent Christian to now serving as one of Barbara Marx Hubbard's props for one of her newest 'conscious evolution' videos. May the Lord help him and may the Lord help us all!